Sooner or later, it was bound to happen. On the way back in from the ride today in Lexington, I had a run-in with a car. It was the intersection of 4/225 and Mass Ave (right by Wilson Farms). The driver of a large pickup truck was pulling out to make a left turn and we were moving along Mass Ave. There were six of us, all in bright green and blue. He stopped and then started to pull out again and then stopped again. I wasn’t sure if he was going to keep going at that point or stop. Scott managed to get around the front, but I basically aimed for the softest landing I could. That landing, as it turned out, was slowing a lot, hitting the front wheel against the front corner panel/bumper and then somehow bouncing back off the hood (I somewhat remember my hands pushing off the hood) and landing on my feet. Unfortunately, in the process, I managed to chip two of my front teeth. 911 was called and Lexington’s emergency services were very quick to arrive with a fire truck, a paramedic, an ambulance, and a police officer. After landing on my feet, I stayed on the ground for a minute or two to make sure all was okay and then moved to the curb. As the paramedics came over, I was pretty sure I was okay and eventually just did the “refused service” with the ambulance. They looked and didn’t see any protrusion or obvious things other than the chipped teeth. The officer was very nice and took my information. Apparently he’s citing the driver. I have all of the driver’s information and plan to follow up with his insurance before long. The bike was ridable for the 2 miles to the shop, but the frame is shot — there’s a huge bend in the top tube and in addition, the rear shifter is destroyed. Pictures in the future. As far as the truck — not sure if there was any damage; I kind of doubt it. All in all, it could have been a lot worse. At this point, the worst pain is that my teeth are a bit sensitive and eating promises to be exciting as I can’t really use my front teeth. I’ve got a small scrape below my right knee and a little bit of soreness in my left knee and my right elbow, but I’ve already started the ibuprofin for those. And I’ve spoken with a dentist and he said it sounds like nothing that needs immediate attention, so I’m to call him first thing Monday morning. The driver’s insurance should, especially given the citation, cover the dental work as well as the bike work and hopefully without a fight, but I’ve already put in the first contact to a local lawyer who specializes in bike accidents. Good guy and former president of MassBike and also previously helped Kate in an accident. Witnesses included Scott, Jen, Barb, Brian and Suraffel. And now, I’m starving, so I’m going to go find some food to cut up into tiny pieces and chew in the back of my mouth. I’m intending to go out tomorrow on the Merlin to unwind a bit and still am planning on doing Seacoast Safari next weekend. And I’m still looking for people to support me on that ride. Hopefully by then with intact teeth! As I offhand mentioned a few weeks ago, I recently built up a new bike. Although my Merlin is awesome, I’ve been wanting to build up something that’s set up a little bit more aggressive and a little bit more geared towards racing as opposed to the long rides the Merlin is for. After a fair bit of looking around, the fact that Quad was going to be becoming a Cannondale dealer for this year led me to settle on the CAAD-9 as a good choice of frame. And since the MIT cycling team is sponsored by SRAM, I figured I’d give SRAM a try — the Merlin has Campagnolo Chorus, but the continuing increase in cost for Campy meant I was interested in trying something a little cheaper. So a SRAM Force group was purchased. Everything finally arrived and I had the bike built up. Odds and ends include an older, but awesome pair of Velomax Ascent wheels, a Fi’zi:k Antares saddle (as I was happy with it on the Merlin), white bar tape, Speedplay Zeros (another new thing to try compared to the Keos on the Merlin). I think it turned out pretty well — it looks sweet and more importantly, is a lot of fun to ride. The setup is definitely more aggressive and it just feels like it wants to go fast. Stiff as rails too. So I’m pretty happy with it. Now, three weeks later, I’ve got about 500 miles on the bike and am really enjoying it. 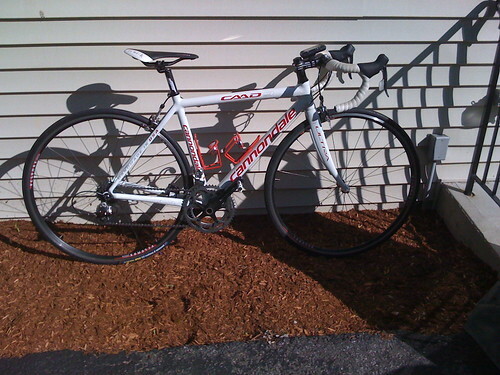 I raced it the first weekend I had it and have also gotten in some other, longer efforts including today’s century. It is meeting all the criteria I set for it. Still to be considered — power meter options and if I want to get a pair of flashier wheels.